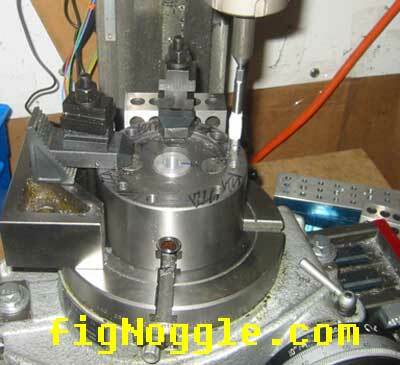 There aren't a lot of publicly verified accessories for the 8x12/8x14 lathe. 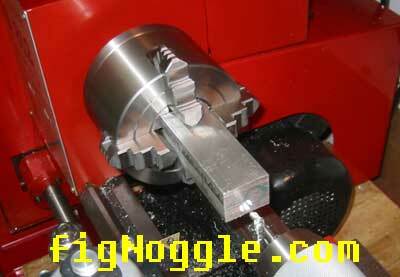 One of the things you may want is to also use a independent 4-jaw chuck for square and odd-shaped workpieces. 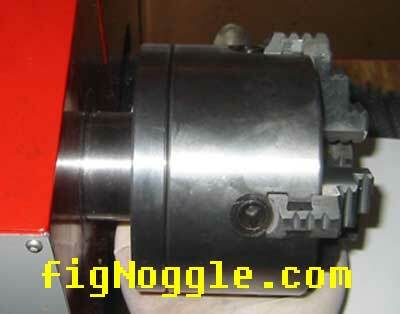 This how-to shows you how to replace the stock chuck and replace it with a 4-jaw chuck. the allen wrench that came with the machine is obviously too long to get at the back of the chuck plate. there are three M8x1 socket head cap screws. we'll need to shorten the length of the wrench by ~1/2". 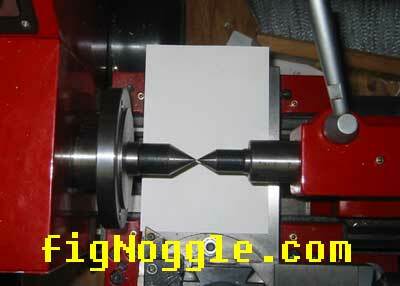 use either a bench grinder or a bandsaw. the wrench should look like this. note: keep the part you cut off. you can use this later. BETTER YET, UNPLUG THE LATHE BEFORE CONTINUING!! there's no spindle lock, so, put the wrench in the back of one of the screws and with the chuck wrench in one of the keyholes, grab both and squeeze. this should loosen the screws. start loosening all the screws. you can use the little cut-off bit to wrench and hand-loosen. it's a good idea to place a rag on the bed so that if the chuck drops, it's won't nick the bed. 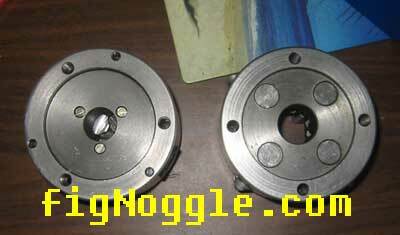 note that there are three mounting holes. while attempting to locate a suitable chuck (not easy and still looking! 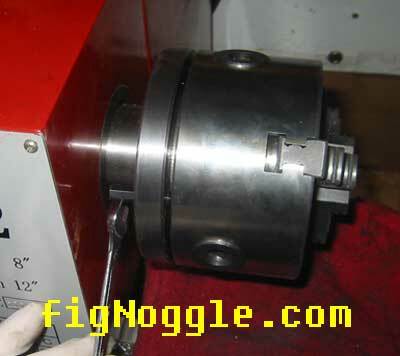 ), there was a shars-brand independent 4-jaw chuck that was purchased for the 7x min-lathe (and of course, it didn't fit on that one). if memory serves, the shars part number is 202-5419 (but it was actually purchased on their ebay website). tip! shars has a website that has advertised specials that are sometimes cheaper than what they list on ebay. here's the back sides in comparison. note that the 4-jaw has as 4-bolt pattern. 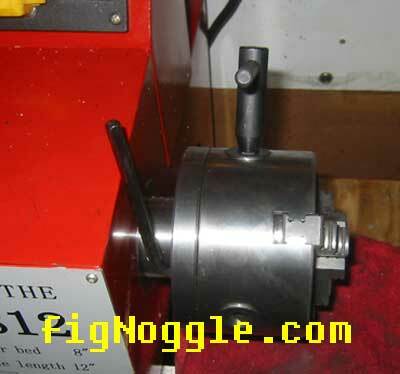 so the option is the drill and counterbore holes in the spindle chuck backing plate (not easy to do and requires some major disassembly of the lathe) or drill and tap three holes in the back of the chuck. 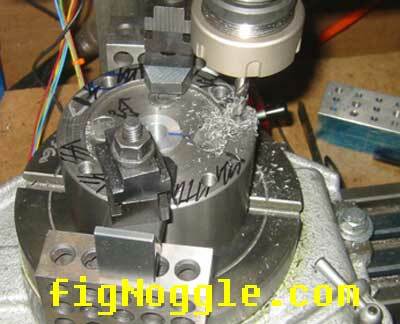 since we know the diameter of the bolt-pattern and luckily have a lathe with a 6" rotary table, we can do this. 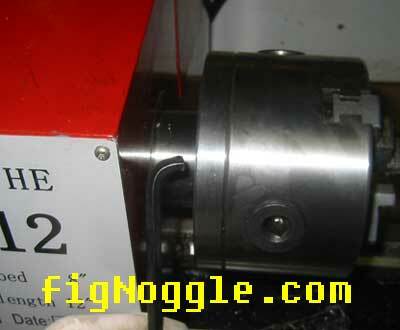 while the chuck is off, we chucked the MT3 spindle taper dead center and the MT2 tailstock dead center to check out any major visual alignment problems. 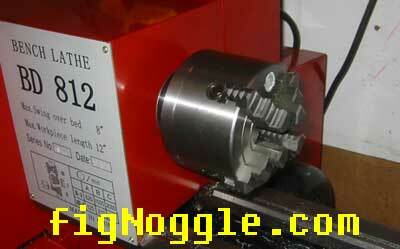 looks good to the eye (we never tested run-out since we unboxed the lathe and put it to some heavy use). this is the first time! 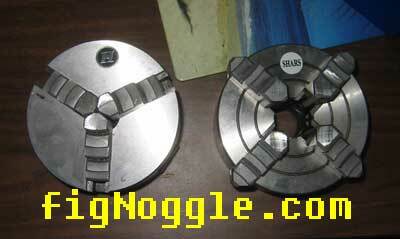 here is the 4-jaw chuck on the backing plate. it fits. apparently, it was meant for this. here's a better shot of the mismatching bolt holes. 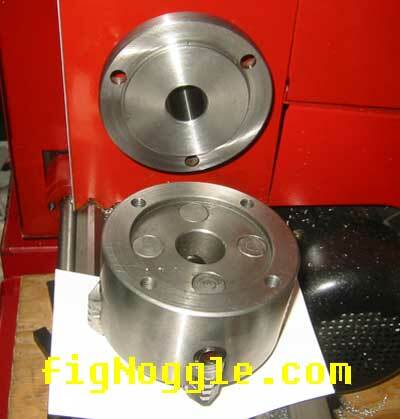 a round stock of 1" diameter was turned down to act as a mounting jig fixture so that the 4-jaw chuck can be inserted into the MT2 taper of the rotary table. this is a test fit. 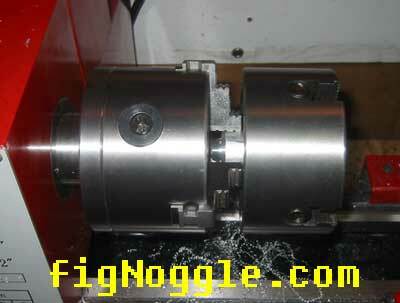 here the chuck is tested for runout while on the rotary table. according to the dti, it's at .004" total. 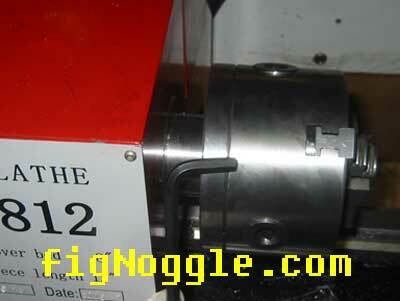 this is acceptable since the chuck's centering primarily depends on the relief shown above. this setup took some thinking and mounting before starting. the final decision was to use one of the existing holes and just drill and tap the remaining two at 120 degrees apart from each other. 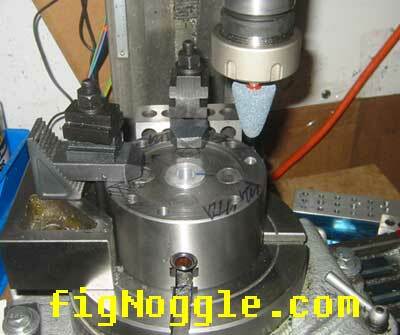 holes were drilled no more than 0.750" deep so as to avoid any interference with the wormscrew mechanisms inside. there was no way to avoid holes being outside a "safe" zone of the worm gears. holes were drilled using an "H" bit. it's off spec by 0.0017". but it will just mean more thread contact. here the holes are being tapped with an M8x1.25 tap. holes should really be countersunk before tapping, so a grinder was chucked in the mill to grind it down a bit instead of using a countersink. 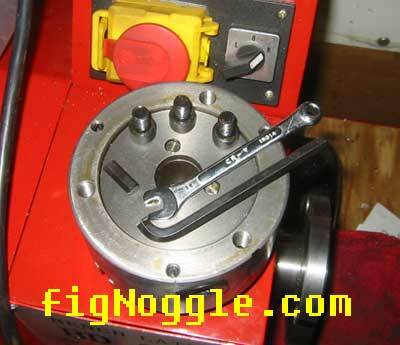 finally non-cylindrical workpieces can be turned. total machine time was under 30 minutes. as usual most of the time was spent setting things up. using the rotary table centering jig really helped a lot.